Home > Students > FAQ > What defines the boundary of the Solar System? What do we mean when we say something has an edge, or a boundary? Some things, like a table or a soccer field have clear edges and boundaries. Other objects, like cities and towns, have boundaries that aren’t as easy to see. It is hard to say where they end and something else begins. The solar system is more like a city than a table or soccer field. 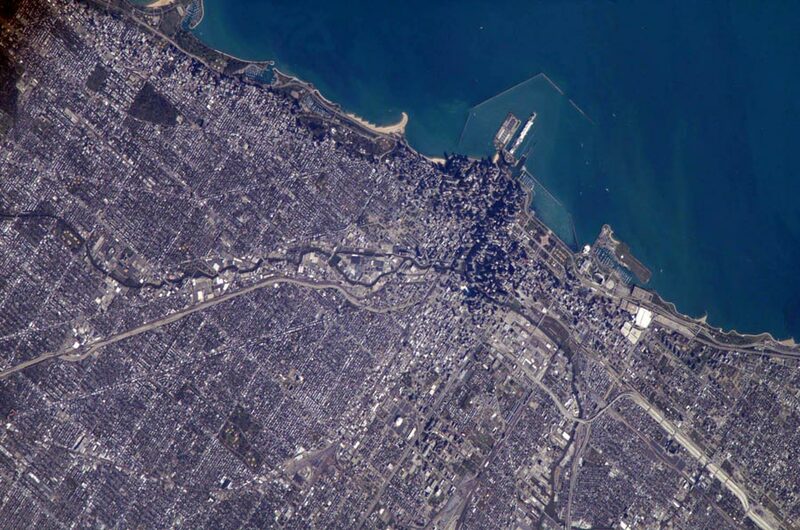 A view of Chicago as seen from the International Space Station. Determining the boundaries of neighborhoods in Chicago from this view would be challenging. You could say that the Solar System extends as far as the influence of the Sun. That could mean the influence of the Sun’s light, or the influence of the Sun’s gravity, or the influence of the Sun's magnetic field and solar wind. Could the reach of the Sun’s light be a good way to decide how far the Solar system extends? The light from the Sun gets fainter as you move farther away, but there is no boundary where the light stops or where it suddenly gets weaker. How about gravity? Just like light, the influence of the Sun’s gravity extends without limit, although it gets weaker farther away from the Sun. There is not a boundary at which it stops. Astronomers are still discovering objects in the outer Solar System beyond Pluto. The solar windA stream of charged particles, mostly protons and electrons, that escapes into the Sun's outer atmosphere at high speeds and streams out into the solar system. is different from light or gravity. As it streams away from the Sun it races out toward the space between the stars. We think of this space as “empty” but it contains traces of gas and dust. The solar wind blows against this material and clears out a bubble-like region in this gas. This bubble that surrounds the Sun and the Solar System is called the heliosphereThe region around the Sun where the solar wind dominates over the interstellar medium.. This is not a bubble like a soap bubble, but more like a cloud of foggy breath that you breathe into chilly winter air. Scientists believe that the closest parts of the heliosphere are 90 times farther away than the distance between the Earth and Sun. That’s three times as far as Pluto. The heliosphere defines one type of boundary of the Solar System.